The humble bumblebee was once taken for granted, but headlines over the last few years detailing the rapid decline of several species of bumblebee have made many of us think twice about their importance. Various species of bee are responsible for pollinating our plants and flowers, and up to one-third of the food we eat is dependent on these little creatures. Here at Highland Titles, conservation is at the centre of everything we do. While we are doing our part to support Bumbleebee conservation – mostly by installing habitat boxes and planting Scottish wildflowers – there are a lot of things we can all do, as individuals, to help with bumblebee conservation in Scotland. Continue reading to find out more! 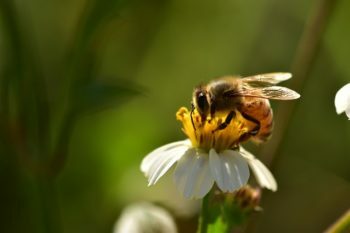 Bees are efficient pollinators and play a crucial role in producing much of the food that ends up on our dinner plates. Crops such as tomatoes, apples, strawberries and peas are dependent on bees. It is estimated that bees contribute over £400 million to the UK economy every year. If bee numbers continue to decline and plants need to be pollinated by other means, the cost of food is likely to increase substantially. Of course, this is not the only reason that bumblebees are important. All species are important regardless of their commercial value to humans, and it is beyond sad that some species are extinct as a result of human activity. Why are bees in decline? Britain’s wildflower meadows are the perfect habitat for bees, providing hedgerows and shrubs for shelter and plenty of pollen. But since the 1930s, an estimated 97% of this habitat has been lost due to intensive farming and ludicrous government subsidies that promoted the removal of hedgerows. Quite simply these rich and diverse habitats have been destroyed in favour of crop production and grazing pasture for animals. Curiously, the government now subsidise the planting of hedgerows, having once subsidised their removal. Many researchers and scientists believe much of the decline in bee population may be due to the heavy use of pesticides in modern farming. The group of insecticides called neonicotinoids are used to control a variety of pests, such as aphids, grubs and weevils. Although they are extremely effective as a pest control method, research suggests they may also be causing serious harm to our bees. Research is ongoing and the evidence is mounting. Thankfully, it looks as though a total ban on the use of neonicotinoids is likely following a major review by the EU. What can I do to help bumblebee conservation? The best way to help the bumblebee is to make your garden as bee-friendly as possible so they have a safe haven in which they can thrive. If you are lucky enough to have a large garden, the easiest way to create an enticing habitat for bees is to simply let a small portion of your land become ‘wild’. Neglecting a patch of land means the long grass will provide shelter for the bees and over time native wildflower species will bed down roots, giving the bees the pollen they so desperately need. If you are working within a more limited space, planting some bee-friendly plants in your garden is just as effective. Many garden centres sell packets of seeds marked “bee friendly” and increasingly plant retailers are highlighting those species which are good for attracting bees. If you fancy a bit more of a challenge, then you can create a bee hotel. Simply cut a hollow bamboo cane into 20cm lengths and tie the sections together into a bundle. Position your bundle of canes in a sheltered position approximately one metre from the ground and within close proximity to garden flowers. If your bee hotel is in position for the end of summer and you might be lucky enough to get solitary bees laying their eggs in the tubes. If you notice one or more of the canes sealed over with leaves, mud, or other material, keep an eye out for baby bees emerging from the tubes the following spring. Encouraging bees into your garden is affordable, easy, and very rewarding indeed. By being more bee-friendly in our approach to gardening we can all make a small, positive difference to the humble bumblebee and ensure these important little species stay around for generations to come. Which bumblebees are found in Scotland? Bumblebees can be seen in Scotland from March till October. There are 24 different species of bumblebee in the UK and 19 of those can be found in Scotland. Bright orange carder bees are also quite easily found readily identified. The tree bumblebee is a new species in Scotland – the first confirmed sighting being in 2013 – and has been recorded as far north as Perth. The tree bumblebee is coloured with black, brown and white. There are 24 different species of bumblebee in the British Isles. Queens, males and worker bees vary in their appearance, as do the colours of various species, which results in a large range of different-looking bees. Only eight species of bumblebee are widespread and abundant, and these species are will probably account for 9/10 of your sightings. A further six species – known as the cuckoo bumblebees – live in the nests of these common species, so they are equally widespread but nowhere near as abundant. The remaining 11 species are either localised and/or specific to a particular habitat, which means they are also far less abundant. The eight most common species in Britain are Common carder, Red-tailed, Early Bumblebee, Tree Bumblebee, Garden Bumblebee, Heath, Buff-tailed and White-tailed bumblebees). The Bumblebee Conservation Trust are a fantastic charity and have produced a very useful identification guide. Bumblebees usually fall into three groups based on tail colour – white-tailed (which includes off-white through to yellow), red-tailed, and ‘uniform-tailed’ bumblebees whose tail is the same colour as the rest of the abdomen (this is usually orange-ginger). This is the most important part of identifying your bumblebee. The next step is to look at the banding patterns on the body, especially for the white-tailed species. A lot of bumblebees have the classic “white-tail and black-and-yellow-bands” look, but the number of thick yellow bands varies from one to three. Clue 3. True or cuckoo bumblebee? Cuckoo bumblebees have hairy hind legs with no pollen baskets. They also have darker wing membranes, a v-shaped edge at the top of the tail colouration, a small brush of black hairs at the end of the abdomen, and relatively short faces. Working out what caste your bee is means working out whether the bee is a queen, worker or male. Queens and workers are usually very similar to each other, with two notable exceptions. Buff-tailed queen bumblebees have an orangey-buff tail, whereas workers of the same species have white tails. As a result buff-tailed workers are often indistinguishable from white-tailed worker bumblebees. Additionally, worker Early bumblebees often lose the yellow abdominal band of the queen and look much darker than their parent. Male bumblebees generally have hairy hind legs without a pollen basket (as do female cuckoo bees). Males also usually have more facial hair than females, and in many species this is a bright, obvious yellow. Males also generally have longer, scruffier hair. Behaviour can also help to distinguish males from workers and queens. Males do not have to collect pollen for the nest. Instead, they sit around on flowers. They can also be seen flying along hedgerows searching for a mate. In stark contrast, female bees appear much busier, buzzing quickly from flower to flower. The time of year can also be helpful. Males are more common in late summer and autumn, whereas females are present throughout the whole lifecycle. As our regular followers will be aware, we are fortunate to work with a number of outstanding conservation organisations who specialise in a particular area.In 2015, the Bumblebee Conservation Trust helped us to create a management plan for the Mountainview Nature Reserve. They have been very busy since then, and we were delighted when Gill Perkins, the CEO of the Bumblebee Conservation Trust, agreed to be featured on our blog in a quick Q&A. Q. Would you like to tell us a bit about yourself and how you got involved with the Bumblebee Conservation Trust? I’ve been an enthusiastic conservationist from a young age, starting with training as an ecologist, building footpaths in Devon as a volunteer, and after leaving college working as an ecologist for the Lake District Special Planning Board. One of the highlights of my early career was counting puffins for the Icelandic National Park. (There were about ¼ million). After a change in career, (I left conservation for a business career and to take a degree in management), I eventually found my way back to conservation taking a sabbatical in Borneo working with a local community to restore rainforest and writing a report for the United Nations on this project. Five years ago I was lucky enough to be employed as Conservation Manager for the Bumblebee Conservation Trust, I had found the perfect channel through which to promote my passion for bumblebees and their protection. More recently I was asked by the Trust to step up as their CEO. I could not have wished for a more challenging and rewarding, inspiring job. It makes my heart sing…..or is that buzz? Q. Like Highland Titles, the Bumblebee Conservation Trust celebrates its tenth anniversary this year. Congratulations! What have been your main achievements? The support and commitment of 9,500 members. (Note: we are looking for our 10,000th member in our 10th year – it could be you)! Engaged the support of 588 volunteers. Worked with over 400 farmers and landowners to create, restore or enhance over 3,000 hectares of flower-rich habitat for bumblebees. Raised over £2.5 million for bumblebee conservation work. Won three awards – “Best Environmental Project, at the televised National Lottery Awards; the Impact Award for Outstanding Environmental Impact through Innovation; and a Global Vision Award for habitat restoration work. Raised awareness of bumblebee conservation issues and how people can help through our website, events, media campaigns and partnerships with other NGOs. Provided expert advice to interested members of the public on all aspects of bumblebee ecology – in the last year we carried out 357 events and engaged with over 20,000 people. Played a leading role in developing the government’s National Pollinator Strategy for England. Launched “Beekind” – a free, online gardening ‘app’ which enables people to make their gardens more bee-friendly. In its first year, 21,308 people used this facility. Participated in and funded high quality scientific research to underpin our conservation policies including ground breaking report into the issues surrounding the importation of bumblebees for commercial purposes was published and Natural England changed licensing based on Peter Greystock’s research. Peter went on to be a NERC runner up for innovation. Provided guidance to the Department for Environment, Food and Rural Affairs (DEFRA) scientist on issues affecting bumblebees and the need for enhanced monitoring of their populations. Successfully carried out and achieved set targets on a £740k project called ‘Bees for Everyone’ that aimed to provide 1200 ha of habitat for bumblebees, engage the general public and provide useful information about what people can do to help the plight of our bumblebees. Awarded £112,000 from the Heritage Lottery Fund to develop an exciting community project in Kent, plus £75,000 for work to protect the Great Yellow Bumblebee in Scotland. Q. What would you like to achieve with the Bumblebee Conservation Trust in the next 10 years? Everybody in the UK gardening for Bumblebees – a bit ambitious I know! A mobile Polli:lab to go round schools kitted up with start of the art scientific equipment to engage and inspire children about Bees…. Q. What does the Bumblebee Conservation Trust believe to be the biggest threats facing our bumblebee populations? The decline of these iconic and charismatic insects can be attributed to a suite of multiple pressures including, climate change, pathogens, increased use and toxicity of pesticides, and undoubtedly the loss of habitat. Since the Second World War over three million hectares (98%) of lowland meadow have been converted to intensive agriculture, urban development or simply been neglected. But loss of habitat is the singular biggest threat and the hardest one to resolve. We are also a growing population which is demanding more and cheaper food. We import 65,000 boxes of commercially reared bumblebees from Europe as we do not have enough pollinators of our own for our soft fruit industry to produce what we need at the price we want to pay. Likewise farmers have more and more pressures on them to get higher and higher yields which requires more intensive farming and more use of insecticides. Q. Our followers are passionate about the natural world. What could they do to help the Bumblebee Conservation Trust? Q. The Bumbleebee Conservation Trust is being featured on the BBC Lifeline appeal on Sunday 19th June (BBC 1 at 3.30pm) and Wednesday 22nd June (BBC2 at 1pm). Are we correct in thinking this could make a massive difference for you? The Bumblebee Conservation Trust’s vision is to ensure that our communities and countryside will be rich in bumblebees and colourful wildflowers, supporting a diversity of wildlife and habitats for everyone to enjoy. The BBC Lifeline appeal is a once in a lifetime opportunity for everyone to understand how vital bees are to our own survival. Conservationists have long recognised the importance of wild bees and their habitats, but the public also values them highly, not just as an interesting wild species, but because we rely on them for much of our food production, and for flower pollination. All people will be affected by the effects of reduced pollination if bees do not receive the help they need. Many are now realising this and want to help. A recent yougov.co.uk poll showed that British people consider the decline in bee numbers to be the most serious environmental issue (85%), above even climate change (83%). It also showed that bees are the one endangered species most people would save: 57% (compared to red squirrels: 14%). As a small national charity raising the awareness through the BBC Lifeline appeal will give us the ‘leg up’ we need to become doubly effective and help Save the Sound of Summer. Keen to help? Why not sponsor a habitat box on the Highland Titles Nature Reserve? Thank you for the article. Here in the USA we are concerned with the death of many due to pesticide use and invasion of Africanized and aggressive honey bees! I have bougainvillea, gardenia, and ixorias in my wee garden. I see bees and butterflies around them! I’m thankful for the work you do in Scotland, my soul’s desire.